Today's post is special in my eyes. Why? Because it's our first beef post. Yes, FIRST ONE EVER after almost three months of blogging and more than three dozen recipes. I've even mentioned it to Gingham Girl (on more than one occasion) that we seriously need to post a beef recipe but it just never happened until now. I'm guessing that, like me, she's not a big red meat eater herself. Just to give you a little history on where I'm at -- I've only recently embarked on a quest to eat less meat. Alot less meat. This is around the time GG and I created this blog a few months ago. Up to that point, I had been eating meat daily including red meat at least a couple of times a week. If we had a blog back then, beef would have been the star ingredient...no kidding. Then, one day I woke up and no longer felt like eating meat, especially red meat. Don't ask me why because I don't know the reasons myself. Maybe reading this had something to do with it or maybe my body was trying hard to tell me something. In any case, my desire to eat meat was gone. Zip. Zilch. It was truly a huge decision, especially for an ex-steak lover like me. Now I realize that the epiphany was my own and I didn't want to force it down my childrens' throats. My kids do enjoy eating meat and I didn't want them to feel deprived. So I sat them down and told them that we would have "meat nights" where I would incorporate meat into our dinner menu. The rest of the week, we would go meatless as much as possible. My quest is not written in stone and there are no rules. It's more of a guideline or a schedule which I have been following and intend to follow as much as possible. Anyway, the kids actually liked the idea so here we are. We're not at a point where we can call ourselves vegetarians but I'm happy to say that we're comfortable with not eating meat everyday. Our meatless dinners have thus far been enjoyable and satisfying. Last night happened to be "meat night" so I decided to make meatballs, something we haven't had in quite awhile. These meatballs can be slow simmered in some tomato sauce and served with spaghetti or they can be baked in the oven with some BBQ sauce which is exactly what I did for last night's dinner. 1. 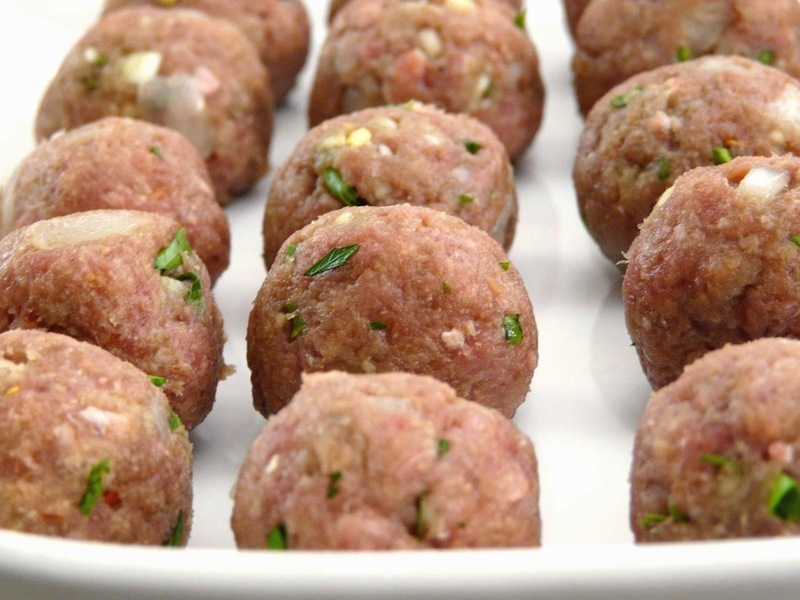 The kind of meat you use will have an impact on just how soft and juicy your meatballs will be. 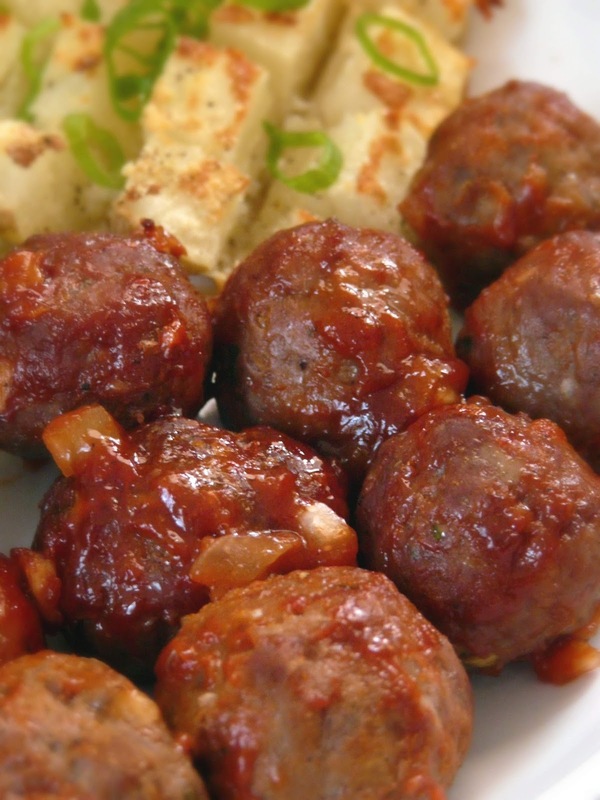 Generally, meat with a little more fat in it will yield softer meatballs. 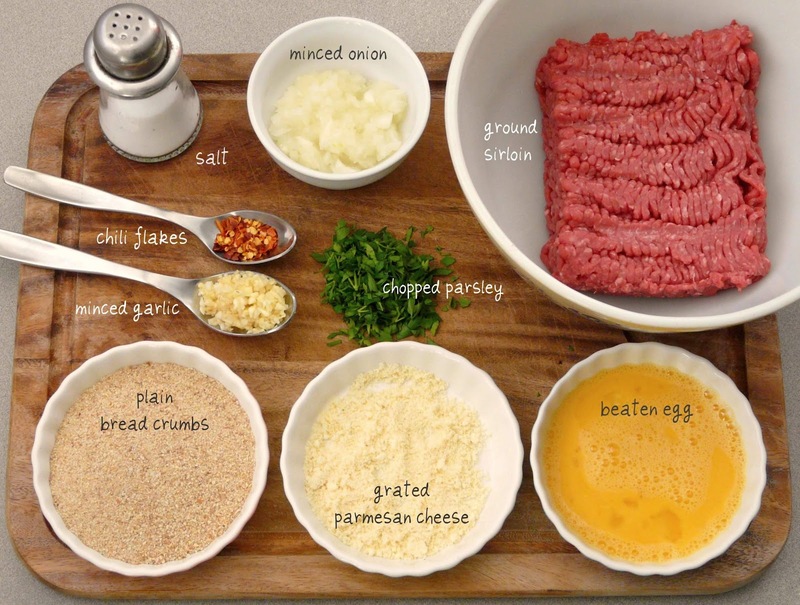 Ground chuck is ideal but I went with lean ground sirloin (90/10 lean meat to fat ratio). It's really just a matter of preference. 2. A liquid mixed in with the meatballs will help keep them moist. Some use milk but I prefer the liquid from grated onion. 3. Slow simmering them in sauce on low heat is key. If you choose to bake them, baste them a few times to keep them moist since they're cooking in dry heat. In a large bowl, add all the ingredients to the ground beef and mix well. Don't be afraid to get your hands in there as you'll want all the seasonings to be evenly distributed. Using the palms of your hands, roll the meat into balls about 2 inches in diameter. Don't roll them too tightly or they won't be as tender. If you're going to simmer them in sauce, you can brown them first in some olive oil to seal in the moisture and to also give them some nice color. Then simmer them in your favorite pasta sauce for about 30 to 45 minutes on low. Need a quick tomato sauce recipe? Try the one in this post. If baking, set aside and make the "BBQ" sauce recipe below or substitute with your favorite BBQ sauce. I use the word "BBQ" here very loosely. 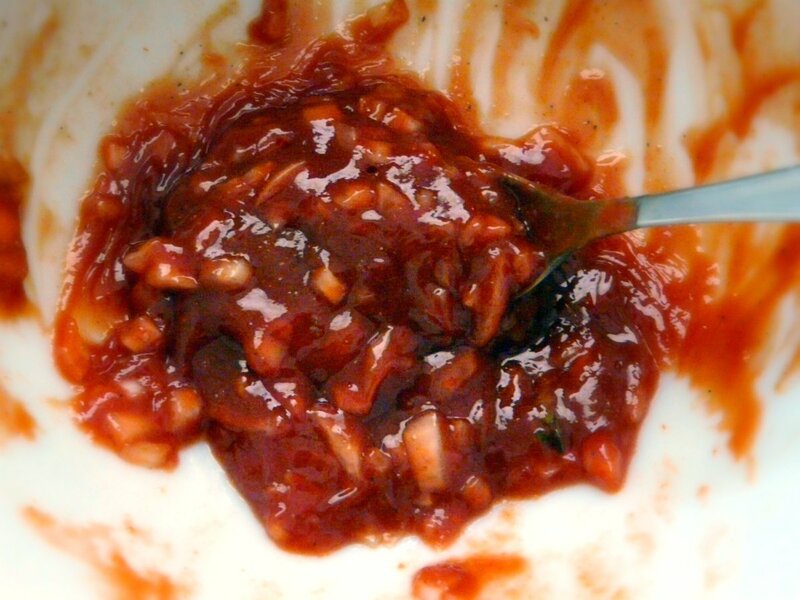 This recipe is really more of a ketchup-y concoction which I've used in the past as a sauce topping for meatloaf. I figured it would also go well with these meatballs. Mix all ingredients together with a small whisk. Pour the sauce over the meatballs and toss them with your hands, making sure the meatballs are well coated with the sauce. Lay them in a single layer on a baking pan and bake in the oven for 45 minutes, turning them over midway and basting every so often. Serve hot with mashed potatoes or in my case, some awesome Parmesan topped potatoes, recipe courtesy of Iowa Girl Eats. It's currently one of my favorite ways to prepare potatoes. So easy and so good! Pierce a few potatoes all over with a fork, microwave in the oven for about 10 minutes or until just tender, cut them into cubes but not all the way through (skin should be intact as much as possible), season with salt, pepper, a little butter and top with grated Parmesan cheese. Broil for 10 to 15 minutes until browned on top. They're creamy on the inside, crisp on the outside! a simple salad with balsamic vinaigrette.